So much dyeing . . . so little time to post! 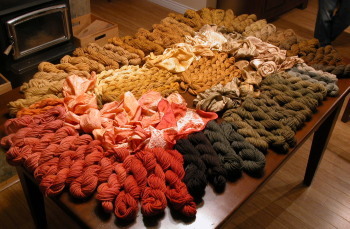 I started gathering up all my skeins and scarves to be tagged for the Fibre Arts Sale this Saturday (an annual event in Sechelt, BC, hosted by the Sunshine Coast Spinners & Weavers Guild) and was surprised to see just how much colour our local mushrooms produced over the last few months. I’m particularly excited about the reds and pinks from the lobster mushrooms – I filled a yogurt container with the dried parings, tied them up in a bag, and the dyepot is still going! I’ll have photos of all the exhausts once the dyepot is spent, as well as images of some of the other more awesome colours (there’s a deep brown-purple at the bottom right in this image, which should show up better in natural light). As you can see, my colour wheel here is heavy on the golds, browns, and brown-greens, all from the abundant Phaeolus schweinitzii the forest gave me this year. The blobs in the middle are silk scarves – again, I’ll try to show them to better advantage in later posts. wow, very impressive. beautiful yarn! great blog as well. Thanks for the kind comments, Tom. I never cease to be amazed at the gift of colour that mushrooms give us.